Yesterday I went for the first time to the Ledbury, a restaurant in the Notting Hill area and thus miles away from anywhere I ever am or might be. It does, however, have two Michelin stars, an extremely stellar reputation and a quite astonishing arrangement for hosting lunches organised by members of the wine-pages forum, of which this was one. The theme was South America. I took the most valuable bottle in my little collection, a 2006 Viu Manent Viu 1, from Chile – bought from the Les Caves de Pyrene sale for £17 but worth somewhere around £45. 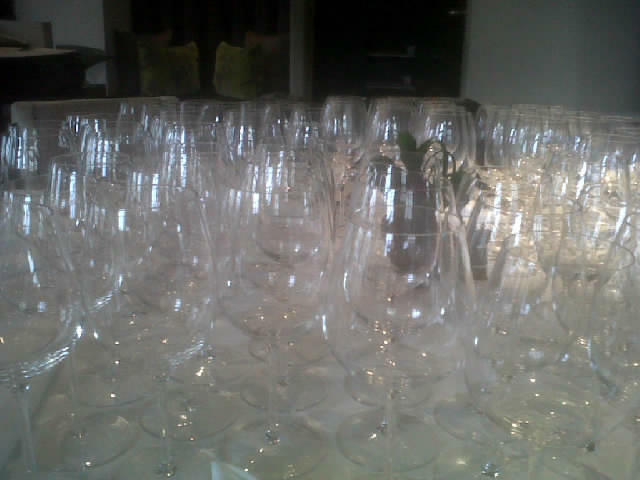 I arrived to see two tables heaving with wine glasses, 10 per man, 90 per table. I handed over the bottle, and sat myself down. For £50, all in, plus the cost of my wine, I got four courses plus bits and bobs at beginning and end, and a taste of everybody’s wines. The food had to strain against the weight of expectation, but did not fail. An amuse bouche of feather-light beetroot meringues stuck together with a foie gras cream was astonishingly wonderful. There followed roasted scallops with romanesque, garlic and brown shrimps, served with three chardonnays; poached pigeon with black pudding, smoked chocolate and pear – probably the finest pigeon dish I’ve ever had – with a couple of malbecs and my wine, a malbec/cabernet sauvignon blend; sika deer, lightly smoked, with beetroot, bone barrow, malt and oxtail – brilliant – served with three more malbecs, one blended with merlot, cab sauv and cab franc; and a creme brulee with dried apricots and cardamom, served with a noble semillon, also from Viu Manent. The wines were all quite impressive, though I don’t think the malbecs went terribly well with the food, the wines being streetfighters and the food being artisans. I think my Viu 1 was the best red on our table, in fact, the cabernet sauvignon rounding out the harsh edges. The food, though, was brilliant. The company varied and, like the internet forum that spawned it, extremely generous and welcoming. It was a thoroughly enjoyable afternoon, a bargain, and I’ll certainly be back for more. And I probably stank worryingly of booze when I picked the kids up from nursery on my way home. This entry was posted in Uncategorized and tagged Eating out, Food, ledbury, malbec, restaurants, viu manent, wine-pages. Bookmark the permalink.